Oculus Rift Virtual Reality Headset. Samsung Gear VR 2017 Note 8 Edition - Oculus Galaxy Note 8 S8 S7 S6 Edge. Condition is Used. Shipped with USPS Priority Mail. VIVE VR System Includes Headset Specs. 2 face cushions. Graphics :NVIDIA® GeForce® GTX 1060 or AMD Radeon™ RX 480, equivalent or better. View the complete list ›. Free trial to VIVEPORT Subscription. One (1) Oculus Rift sensor with stand. Adaptors for the HTC VIVE VR headset (note the lenses are not included). This is a pair of adaptors to fit Samsung GearVR (2016 and 2017) 42 mm lenses onto an HTC Vive (also tested and working on Vive Pro). AUKEY VR-W1 Cortex 4K HMD. Display Type: Low-Persistence Custom 4K Panel. Resolution: 4K 3840 × 2160; 8.29M pixels; 806 PPI. Comfortable, lightweight (499g / 17.6oz) headset with secure, adjustable fit for extended use. Bluetooth version. Wireless distance. -Small and Light: convenience to carry to everywhere ,easy to operate, cool and fashion. 1 x User guide. Support system. 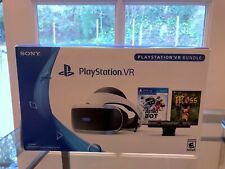 Hardcode VR,VR Wrong Voyage for Cardboard,VR Zombies Shooting,Sniper VR,VR Horror House Limited,VR GirlFriend,VR PRO SNIPER,FastHit VR,VR Labyrinth,Gravity Train VR,Animal Zoo - VR, 360 VR Virtual Zoo 3D,Sniper VR Zombie Shooter 3D,VR Zombies Combat,nCell VR (Cardboard),Cardio VR,Battle 360 VR,RollerCoaster. No scratch on lens. And very good condition. Including everything in the pictures. Unit is unused, factory stickers still attached. For Google Pixel, For Google Pixel XL, Universal, For Google Pixel 2, For Google Pixel 2 XL. Product Key Features. Field of View. Phone Screen Size. Product Information. 96 Degrees. Bluetooth, USB-C. It takes interaction to the next level. Touch enables natural hand presence, requiring little thought about how to use your virtual hands or what to do with them. Think of it as a set of human hands in the virtual world. VR-TEK - WVR1 PC VIRTUAL REALITY HEADSET - (WINDOWS 7 OR HIGHER) UNTESTED (A43. Condition is New. Shipped with USPS Priority Mail. 1 x VR Glesses Eye Mask Pad. Eye Mask Pad only, other accessories demo in the picture is not included! Easy to wipe them with anti-bacterial or alcohol. Material: PU & foam. Due to the difference between different monitors, the picture may not reflect the actual color of the item. Google Daydream View VR Headset Latest 2018 - 2019 Version 2 Upgraded Cooling. This is the latest version of the headset that does not have the heating problems of the previous model. In excellent condition. Come with remote and instructions in box. I combine on shipping for multiple wins. I ship worldwide. Any questions, just ask. Thanks for looking!!! Train as a force-sensitive apprentice and unlock the knowledge of the Jedi order. Awaken your inner Jedi. 1x Lightsaber. Lenovo Star Wars - Jedi Challenges Virtual Reality Set, iOS/Android Compatible. This item is the LG 360 VR Headset for use with the LG G5 smartphone only! 1 x LG 360 VR Headset. -Headset Solution: 3.5 mm Headphone Jack. Enjoy with 360 Contents. You Will Also Receive. User Created Content Support. Google Daydream View Charcoal | VR Headset (Virtual Reality) Condition is New. Box opened but never been used.Dispatched with Royal Mail 1st Class. 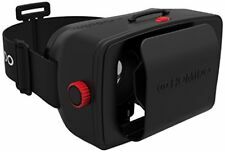 This is GenuineSamsung Gear VR4 2017 SM-R325 USB Type-C Adapter. - Samsung Galaxy Gear VR 4 2017 SM-R325 Only. It is designed to fit the Samsung Galaxy S8, S8 , Note8, S9, and S9 . Put on the Gear VR and go from front-row experiences to adventures you've only dreamt of. Ergonomic design: For a more comfortable and interactive VR experience. User Manual. This product is not compatible with the Note 9. Condition is Used but perfectcondition. Or ig in al b ox. Gr ea t un it, minimal use. SAMSUNG GEAR VR 2017 GALAXY Complet COMME NEUF! SAMSUNG Gear VR avec contrôleur. Galaxy note8/ S8/S8 /S7/S7edge/S6edge /S6/S6edge. Complet en très bon état. Can work with 9 LED base station. NOTE: The channel button was stuck. To get it working I removed a small piece of plastic around.Now It fully working now. Oculus Sensor for Rift. Includes box, stand, and 16-ft extension cable. Opened box, never removed. Oculus Sensor for Rift. Includes box, stand, and 16-ft extension cable.. Condition is Used. Shipped with USPS First Class Package. Only by assuming the identity of The Guardian, a futuristic combat soldier with a taste for vengeance, can you hope to lead the assault to fight the remaining enemy combatants that still litter the destroyed remains of the precious city you once knew. Engage other players in intense 1-on-1 local multiplayer battles in the new Lightsaber Versus Mode. Train as a Force-sensitive apprentice and unlock the knowledge of the Jedi Order. Now with a free content update! Description: Use your smartphone to immerse yourself in the enjoyment with this ergonomically designed SHINECON 6.0 Plus VR headset. With the SHINECON 6.0 Plus VR, you can play amazing games, watch best movies in your own 3D IMAX private cinema ( or even on the moon! ), be at the center of a suspense thriller, and so much more. This virtual reality headset equipped with earphones, and support adjust volume, play and pause, answer the phone, etc. Besides, it also supports IPD adjustment and focus adjustment, which enable those myopic people ( 0 - 600 degree ) to have a clear view. This virtual reality helmet glasses makes the virtual world more accessible than ever. Prolunga multipresa smart. Informazioni aggiuntive Si prega di essere pazienti. Temperatura di lavoro-10 – 40 °C. Socket designSchuko. Box has little shelf wear mostly on the corners and edges. Box has been opened but product has not been used. Sold as is. See pictures for discrepancies/details. BUY IT NOW.